"I got this idea from a restaurant, long before wraps were popular. The restaurant went out of business, so I had to figure out how to make my own." Spray a skillet with vegetable spray. Salt and pepper chicken. Heat skillet over medium heat. Brown chicken breasts well on both sides, about 4 minutes per side, or until cooked through. Remove from skillet and set aside. Spread tortillas evenly with cream cheese. (this will be the "glue" to hold everything together.) Cut chicken into small pieces and divide between the tortillas, leaving about 1 1/2 inches of tortilla uncovered on one side. 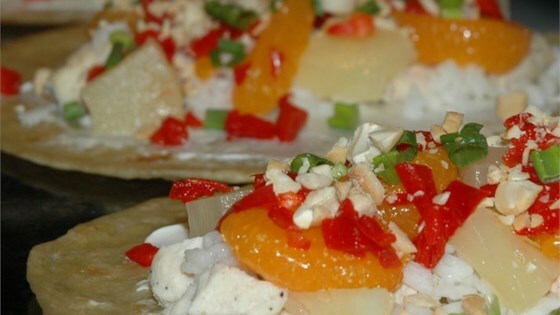 Top chicken with Mandarin oranges, pineapple, green onions, bell peppers and cashews. Roll up tightly. Wrap tightly in plastic wrap and refrigerate for about 30 minutes before serving. I didn't really like them but my husband did. I guess it's a to each his own kinda thing. These are incredible! Easy to make, easy to find ingredients for and a really unique taste. I added lettuce and halved the amount of chicken per wrap, and it still tasted yummy and filling. A great alternative to boring sandwich lunches. Very Good! My fussy Mother loved it.